UK, 1980, 105 minutes, Colour. Charlton Heston, Susannah York, Jill Townsend, Stephanie Zimbalist. 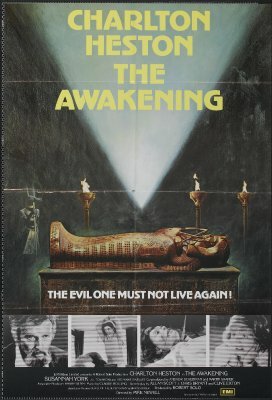 The Awakening combines the mummy movies with all those Curse of the Pharaohs' Tombs stories (and the original story is by Bram Stoker) with more than echoes of The Omen, especially in the graphic deaths and their styles. Charlton Heston, solid and rather ageless, digs up a Pharaoh's nameless wicked daughter with predictable enough results. He gives a strong portrayal of the obsessive and arrogant archaeologist. However the production is high quality, beautifully photographed from credits to Egyptian desert and museum locations and England. Susannah York is heroine and Stephanie Zimbalist, Heston's ill-fated daughter. The pace is measured (for those who like it), slow and dull (for those who do not). 1. The popularity of Bram Stoker's stories? Stories of excavations and explorations in Egypt? The folklore about curses of Pharaohs' tombs? The popularity during the 20th. century? The atmosphere of the mysterious, superstitious and exotic? The quality of this contribution to the genre? 2. The importance of the colour photography, Panavision? The use of Egyptian locations and atmosphere? Britain, America? The beauty and atmosphere of the credits? The importance of the special effects, especially for violence? The eeriness of the finale and the conclusion? The musical score? 3. Audience interest in Egypt, archaeology? Matthew Corbeck and his work? The detail of the excavation work, the search, the difficulties of pinpointing locations? The team? Jane and her assistance? The build-up to the finding of the tomb, the contrast and interediting with Anne and her giving birth to Margaret, Corbeck opening up the tomb? A melodramatic combining of Margaret with Kara? 4. Charlton Heston's strength as Matthew Corbeck, a man of intelligence but obsession, the preoccupation with the Princess, sexual overtones? The puzzle about her identity? His growing obsessiveness as regards the tomb, his rights to it? 5. The background legends of Kara, the information given, her evil, her relationship with her father? The effects on the discovery of the tomb? The effect on Margaret at her birth? The brutal death of the official and the way this was filmed? 6. Margaret and her growing up, her charm, visit to England, love for Paul? The effect of Kara on her? Her nightmares? Jane's death? Her father? The psychologist and his murder? The build-up to her being possessed? The ritual and her relationship with her father, the kiss and his death? Her shadow over England? 7. The parallel with the transferring of Kara's tomb to England? Dr. Khalid and his violent death? Corbeck's continued obsession? The build-up to the ritual? The bones, the Jewel of the Seven Stars? 8. The portrait of Jane - devoted worker, in love with Corbeck, her role in England, the violence of her death? Her seeming importance yet arbitrary death? 9. The contrast with Anne in the earlier part of the film, Anne in America, her arrival in England? 10. The build-up of the obsession? The arguments with Corbeck about the remains going back to Egypt? Paul's warnings? The obsession and the ritual, the incestuous overtones, sexuality? Corbeck's death? The inevitability of this death? 11. The sinister aspects of Kara's shadow over England and its foretelling of future evil? 12. The slow and measured pace of the film, its interest, its serious aspects and treatment of a popular theme, superstition, the possibilities of such evil? The overtones of such violent films of the occult as The Own ? even to visual echoes of the deaths?